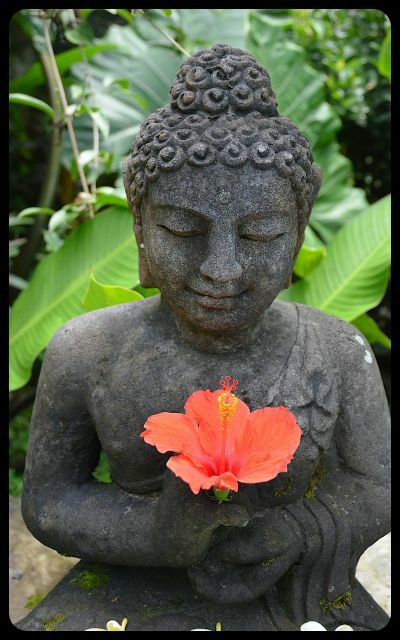 At our home away from home in Bali, Indonesia, this Buddha statue greeted us daily with a splendid flower in hand. The flowers — quite often hibiscuses or frangipanis — had been carefully selected and placed by the homestay’s hostess, Ayu. Like the practice of making canang sari, Ayu’s ritual is another example of the spiritual offerings regularly performed by residents of this gentle island. This post uplifted me for the afternoon. I remember these offerings, adorning statues all over Bali, from our trip there in 1992. The practice is magical, isn’t it? I remember reading a statistic that some of the Balinese spend about 30-40% of their income on spiritual practices!